HOME OF "THE PROPER PIE"
HOME MADE FOOD & A PINT. Our beautiful pub & restaurant, set in Southerndown on The Heritage Coast, with stunning views over the cliffs of Southerndown and Dunraven Bay and onto the Bristol Channel. 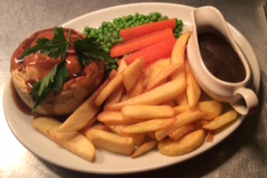 Our reputaion as "Home of the Proper Pie" depicts the fact that all our food is home-made and prepared on the premises. Our home-made food can be served by our friendly staff in our restaurant, our lively sports bar (dogs welcome)or on our large patio. 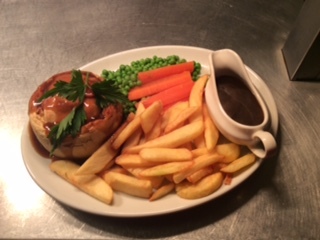 Our sports bar has a large screen TV playing Sky Sports, a dart board & pool table if you like to unwind over a friendly game and for those music lovers we also have a jukebox and occasional live music. Being located in the stunning heart of Southerndown in The Vale of Glamorgan, a couple of hours is not enough to take in our breathtaking scenery and beautiful landmarks. We have recently opened a campsite located directly behind us with great facilities and a fantastic view over the Heritage Coast.